Okay, so it's that time of year when we start thinking of pulling holiday decorations from their dark, almost forgotten storage areas. 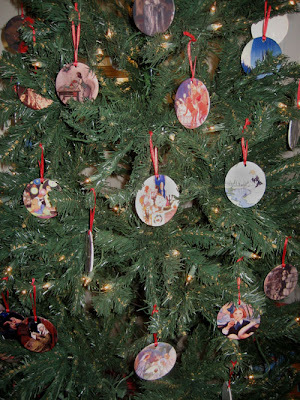 I have noticed that a few people are ordering the fairy tale themed ornaments on CafePress. They are finding them in the CafePress Marketplace for $14.99 each, sometimes able to use a coupon there to purchase. But for you loyal readers here, I'll let you in on a secret. They are available for $7.99 in the SurLaLune CafePress shop. You can't use a coupon there but this price still beats any coupon promotion in the Marketplace. 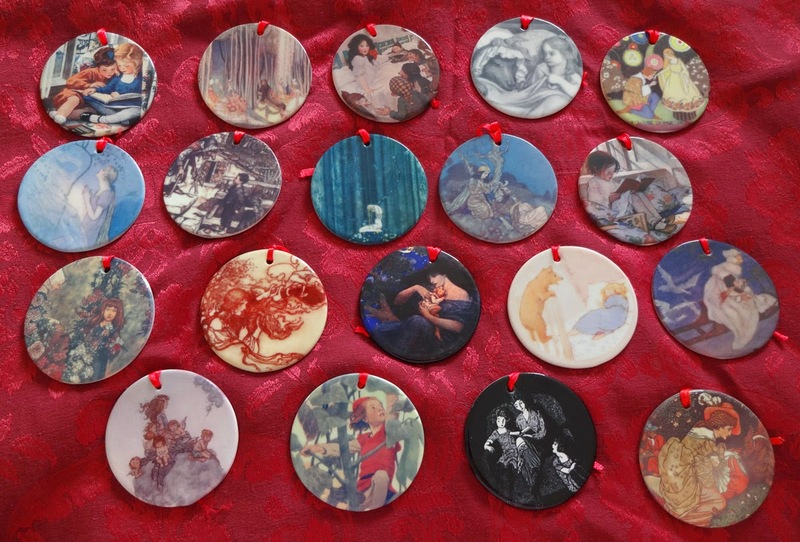 Many Golden Age illustrations are available in the Ornaments shop I created years ago. And, yes, SurLaLune gets more than double the commission on the sale, too, despite the much lower price. Everyone wins! 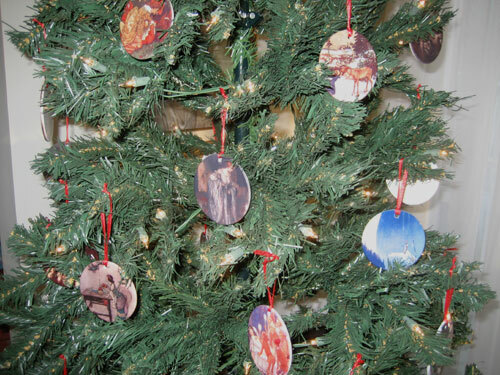 As seen in the photos here, I own a lot of these ornaments. I don't decorate with fairy tales much in my house--sometimes I need a separation of church and state--but these ornaments have been favorites for years. 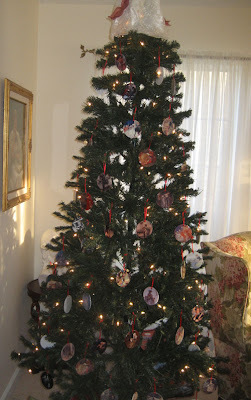 That's actually our tree in 2011 when I didn't pull out the other ornaments to fluff the tree more. 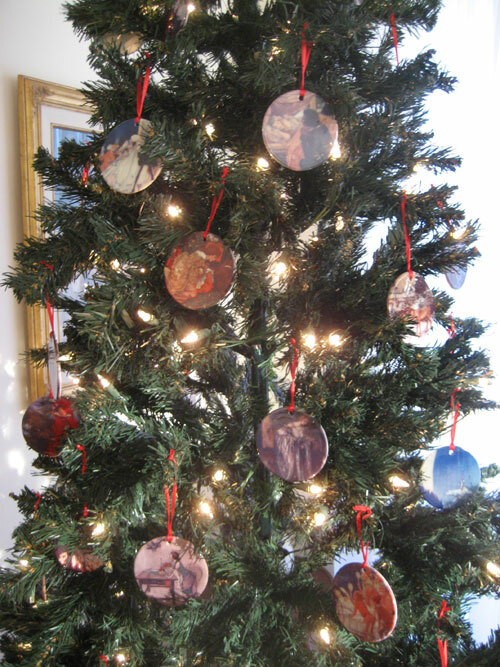 We now have a bigger tree in a different house so I get to fill it with these ornaments even more. Now that all the nephews and nieces are older, they really enjoy identifying the stories on the ornaments. Each year I catch one of them studying the ornaments and looking for favorites. This year I am thinking of figuring out everyone's favorites and buying some to save for when each of the kids start their own trees someday. My house is one of the holiday hubs so those ornaments are part of the subtle holiday memories for my beloved brood. Ireland's Immortals: A History of the Gods of Irish Myth by Mark Williams is a new book released this week. If you are interested in Irish folklore, this is a must for you. This is a hefty tome of nearly 600 pages. I received a review copy but haven't had the time to read it closely yet. However, I have read some passages and the first impression I have is, "Wow, I didn't know that about ____." Fill in the blank to whatever I was reading on the page. The second impression is "This is surprisingly very readable for how scholarly and informational it is." Because, yes, I, too, struggle with twenty-five cent words in many academic texts. If I paused to consider a sentence while I was reading this, it wasn't to parse the meaning of the sentence but to contemplate that meaning. The tone is even conversational with first person perspective offered which may be off-putting to some but which I find refreshing since that is the way I approach much of what I write. Reading this book makes you think that Mark Williams would make a fascinating dinner companion. The earliest written evidence for native gods comes from early Christian Ireland, not from the pagan period; this is a pivotal fact which must be emphasized. Christianity did not entirely consign the pagan gods to the scrapheap, but the consequences of its arrival were dramatic and affected Irish society on every level. Pagan cult and ritual were discontinued, and a process was set in motion that eventually saw a small number of former deities reincarnated as literary characters. Christianity—intrinsically a religion of the book—enabled the widespread writing of texts in the Roman alphabet. Some of these have been transmitted to the present, with the paradoxical upshot that we owe our ability to say anything at all about the ‘personalities’ of Ireland’s pre-Christian gods to the island’s conversion. That's fascinating and highly readable stuff if this is the type of stuff you like to read. Which if you are here, you most likely do. There is also an excellent index which is what I used to look up passages with names and concepts I am familiar with--Yeats is represented abundantly but I also found Lady Jane Wilde--some of who's Ancient Legends, Mystic Charms, and Superstitions of Ireland I have been reading recently, she was a folklorist of sorts and mother to Oscar Wilde--as well as other writers such as James Stephens and Walter Sharp. So if this topic interests you at all, I'd consider this one to be a new important addition to your library. It's earned a place on my shelves. Ireland’s Immortals tells the story of one of the world’s great mythologies. The first account of the gods of Irish myth to take in the whole sweep of Irish literature in both the nation’s languages, the book describes how Ireland’s pagan divinities were transformed into literary characters in the medieval Christian era—and how they were recast again during the Celtic Revival of the late nineteenth and early twentieth centuries. A lively narrative of supernatural beings and their fascinating and sometimes bizarre stories, Mark Williams’s comprehensive history traces how these gods—known as the Túatha Dé Danann—have shifted shape across the centuries, from Iron Age cult to medieval saga to today’s young-adult fiction. We meet the heroic Lug; the Morrígan, crow goddess of battle; the fire goddess Brigit, who moonlights as a Christian saint; the mist-cloaked sea god Manannán mac Lir; and the ageless fairies who inspired J.R.R. Tolkien’s immortal elves. Medieval clerics speculated that the Irish divinities might be devils, angels, or enchanters. W. B. Yeats invoked them to reimagine the national condition, while his friend George Russell beheld them in visions and understood them to be local versions of Hindu deities. The book also tells how the Scots repackaged Ireland’s divine beings as the gods of the Gael on both sides of the sea—and how Irish mythology continues to influence popular culture far beyond Ireland. Mark Williams is the Simon and June Li Fellow in the Humanities and Tutor in English at Lincoln College, University of Oxford, where he teaches medieval Irish, Welsh, and English literature. He is the author of Fiery Shapes: Celestial Portents and Astrology in Ireland and Wales, 700–1700. Fairy Tales for the Disillusioned: Enchanted Stories from the French Decadent Tradition (Oddly Modern Fairy Tales) edited by Gretchen Schultz and Lewis Seifert is officially released this week. So I admit that my studies of French literature have been limited. I have a French minor that didn't go too far beyond Antoine de Saint-Exupéry and Moliere, to be quite honest. My own studies and research have focused on original fairy tales texts from the French Salons from Villeneuve to Perrault and many of the French folklore collectors of the 19th century, not so much the literary retellers. We won't get into the argument here that even those collectors were literary retellers--that's for somewhere else, not this book's review. So I am not very familiar with the French Decadent Tradition. Which is why this book is so much fun and intriguing at the same time! I get to learn about a literary movement and read some more relatively modern interpretations of fairy tales. The decadent is a moral description--these tales are filled with references to sadomasochism, hedonism, etc. Nothing was overly graphic in the tales I have read so far, the time and place when these were written were usually more subtle in their descriptions and references. Perhaps even more apt is the "disillusioned" moniker. These tales are not hopeful and don't deliver "happily ever afters" but are retellings, new tales, or codas to familiar tales that debunk the HEA. So it may not be a book for reading in one sitting either. The mood created while reading them can be quite grim. Perhaps I shouldn't use grim--how about morose or bleak? But they make excellent windows into a period in history, especially in France, when politics and world strife--most were written in the decades before and during WWI--made it hard to embrace the HEA of the popular fairy tales, especially those of Perrault. So Cinderella, Sleeping Beauty and Bluebeard get many morbid treatments here. Finally, many of the tales in the collection have been translated and published in English for the first time. See the Table of Contents below to see those. The wolf is tricked by Red Riding Hood into strangling her grandmother and is subsequently arrested. Sleeping Beauty and Cinderella do not live happily ever after. And the fairies are saucy, angry, and capricious. Fairy Tales for the Disillusioned collects thirty-six tales, many newly translated, by writers associated with the decadent literary movement, which flourished in France in the late nineteenth century. Written by such creative luminaries as Charles Baudelaire, Anatole France, and Guillaume Apollinaire, these enchanting yet troubling stories reflect the concerns and fascinations of a time of great political, social, and cultural change. Recasting well-known favorites from classic French fairy tales, as well as Arthurian legends and English and German tales, the updated interpretations in this collection allow for more perverse settings and disillusioned perspectives--a trademark style and ethos of the decadent tradition. In these stories, characters puncture the optimism of the naive, talismans don't work, and the most deserving don't always get the best rewards. The fairies are commonly victims of modern cynicism and technological advancement, but just as often are dangerous creatures corrupted by contemporary society. The collection underlines such decadent themes as the decline of civilization, the degeneration of magic and the unreal, gender confusion, and the incursion of the industrial. The volume editors provide an informative introduction, biographical notes for each author, and explanatory notes throughout. Subverting the conventions of the traditional fairy tale, these old tales made new will entertain and startle even the most disenchanted readers. "French fairy tales are too often associated only with the emergence of the genre, especially Charles Perrault's influential stories, and then much later with fairy-tale films. Where did all the fairies go in the nineteenth century? Featuring a wide range of translated decadent fairy tales from France, this welcome and entertaining collection fills a large gap in English readers' access to such texts. It will definitely have a place in my library." --Cristina Bacchilega, author of Fairy Tales Transformed? Charming (Pax Arcana Book 1) by Elliott James is on sale in ebook format today only for $2.99. This is the first book in a series. New Approaches to Teaching Folk and Fairy Tales edited by Christa Jones and Claudia Schwabe was released in August. First of all this is not a text book. It is a collection of articles about different methods of teaching folklore in the classroom. The contributors share their experiences in the classroom, sometimes including the syllabi for the classes they have designed. The articles are wide ranging in their approaches, including but not strictly limited to political, linguistic, and gender studies. They are valuable because they offer perspectives from real world experiences from professors who have used these approaches. One of the themes I found most fascinating was the discussion about choice of translations and adaptations to share in the classroom, including Christine A. Jones' course that studies the translation of French tales. In the end, the articles make you wish to be a student again--if you aren't now--with the ability to take all of these classes (since they are scattered at various universities around the globe) and participate in the classroom discussions, to see and feel how these materials spark inspiration and understanding of folklore and dare I say the world, too, for the students. New Approaches to Teaching Folk and Fairy Tales provides invaluable hands-on materials and pedagogical tools from an international group of scholars who share their experiences in teaching folk- and fairy-tale texts and films in a wide range of academic settings. This interdisciplinary collection introduces scholarly perspectives on how to teach fairy tales in a variety of courses and academic disciplines, including anthropology, creative writing, children’s literature, cultural studies, queer studies, film studies, linguistics, second language acquisition, translation studies, and women and gender studies, and points the way to other intermedial and intertextual approaches. Challenging the fairy-tale canon as represented by the Brothers Grimm, Charles Perrault, Hans Christian Andersen, and Walt Disney, contributors reveal an astonishingly diverse fairy-tale landscape. The book offers instructors a plethora of fresh ideas, teaching materials, and outside-the-box teaching strategies for classroom use as well as new and adaptable pedagogical models that invite students to engage with class materials in intellectually stimulating ways. A cutting-edge volume that acknowledges the continued interest in university courses on fairy tales, New Approaches to Teaching Folk and Fairy Tales enables instructors to introduce their students to a new, critical understanding of the fairy tale as well as to a host of new tales, traditions, and adaptations in a range of media. Below is my post from two years ago about Ray Bradbury's The Halloween Tree which is currently on sale in ebook edition for $1.99. The Halloween Tree by Ray Bradbury: I wanted to recommend it as a great book that shares Halloween traditions with readers young and old. The folkloric content is of interest to the usual SurLaLune reader which is why I am sharing here. A dear friend loves the book and has written a much better post about the book and how it has become an annual part of her Halloween celebration at this post: The Halloween Tree. I missed recommending it here last year because it was too late when I thought of it. Why torture you with what you couldn't order in time to use for the holiday? Hubby John shared this with me several weeks ago and I kept forgetting to post it, cause LIFE. I've seen a lot of advertising for mattresses using Goldilocks over the years--funny how it's almost always mattresses, never chairs, and rarely food--and this is one of my favorites to date. No, not the egg test but the fun references to the fairy tale make it charming for me. Mallory Everton, or Goldilocks here, is a favorite, too. During this busy time, I've really missed the Fairy Tales in Advertising posts I enjoy sharing so much. Rank commercialism using fairy tales always fascinates me. This Geico commercial is one of the newest to use Sleeping Beauty. What if Prince Charming's kiss never woke Sleeping Beauty? What if Sleeping Beauty was never actually "asleep" at all? This latest 'It's What You Do' campaign commercial turns a classic fairy tale on its head with one of the oldest tricks in the book. Looking for a not scary, lighthearted fairy tale book for Halloween for the youngest people in your life? Then check out Fairy Tale Frankie and the Tricky Witch by Greg Gormley (Author) and Steven Lenton (Illustrator). The fairy tale connection is generic characters from fairy tales--princess, king, knight, etc.--not specific fairy tales. Now I am trying to think if there are any Halloween related books with specific fairy tale characters in them. None are coming to mind. Anyway, this one will amuse the toddler set and is definitely not scary with lots of purple and pink to spare. I like that Frankie takes charge in the crisis and saves the day. And this doesn't have to be for Halloween, but it is a great book for the holiday, too. As always, clicking on an image will open a larger image of it to view and read the text. Big Announcements for SurLaLune: What's Coming Soon! So I am concerned that everyone thinks that SurLaLune is being neglected. The truth is, that is anything but true. Yes, it's been a horrendously busy year for me in all other areas of my life, but SurLaLune is always on my mind. A day doesn't pass when I don't think of it or do something with it at least behind the scenes. That said, most of the SurLaLune work is behind the scenes right now. But it will be rising again to public visibility soon. 1. 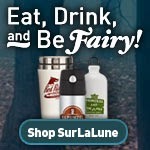 A NEW SurLaLune Fairy Tales site design is coming in the next few months! It's past time and this is what is taking a lot of focus from things like my blogging time but I have a team on this one this time. The new site will be modernized to fit mobile responsive needs, but we are aiming to keep the content as much the same as possible. 2. Three new SurLaLune Tales From Around the World books! Well, two new ones and a second edition on an older title. First up will be: Puss in Boots and Other Cat Tales From Around the World. That will be released on Halloween, so it is coming QUICK, QUICK, QUICK! There are over 250 tales in the book. It's massive and I am hoping it will be as loved as Mermaid and Other Water Spirit Tales From Around the World, the official SurLaLune series bestseller. Second will be a Diamonds and Toads title: Kind and Unkind Girls Tales From Around the World. Finally, in early 2017, there will be a new expanded edition of Sleeping Beauties: Sleeping Beauty and Snow White Tales From Around the World. The first edition is out of print now and it was time to add more tales and update the design of the book's interior anyway. The first edition of Sleeping Beauties used to be neck in neck in top sales with the Mermaid and Other Water Spirit Tales From Around the World title, but now that it's been out of print for six months, it's sitting in a firm second place. 3. When we launch the new site, I will also be revising the SurLaLune CafePress shop. Many of the old designs will be retired but there will be new ones, like the one for Bluebeard at the top of the page by Aaron McMillian. Aaron has been one of my fairy godfathers of late, working on the site redesign as well as finding inspiration in the tales and creating new, awesome illustrations for me to use on new materials. If you have designs that you really like there, please let me know because I don't plan to keep much. I will be refining and whittling it all down to more manageable and updated designs. And if you have a wishlist of something you'd like to see on a shirt, mug, coaster tile, shower curtain, etc. let me know. I may be able to make that happen! The Witch: And Other Tales Re-Told by Jean Thompson is on sale in ebook edition for $1.99. A National Book Award finalist and bestselling author, Jean Thompson’s new collection of “bewitching improvisations on fairy tales” are “spellbinding” (Booklist, starred review). Jean Thompson—author of the National Book Award finalist Who Do You Love and the New York Times bestseller The Year We Left Home—is a writer at the height of her powers. Capturing the magic and horror in everyday life, Thompson revisits beloved fables that represent our deepest, most primeval fears and satisfy our longings for good to triumph over evil (preferably in the most gruesome way possible). From the wolf in “Little Red Riding Hood” to the beauty asleep in her castle, The Witch and Other Tales Retold triumphantly brings the fairy tale into the modern age. It's the Disney Version! : Popular Cinema and Literary Classics by Douglas Brode (Editor) and Shea T. Brode (Editor) was released over the summer and I'm playing catch up this week. I haven't read this one yet, but the brief skim of the intro leads me to believe it is more Disney apologist in tone than some might like, but I appreciated the arguments that were more pro-Disney--namely that Disney didn't create its fairy tale films out of a vacuum, but drew from other contemporary adaptations from stage and elsewhere, too. Examples and footnotes are provided, too, so this one intrigues me for the fairy tale adaptation discussions especially.